It’s National Pollinator Week! Is Your Lawn Pollinator Friendly? National Pollinator Week is June 18th through 24th with thousands of events planned across the country! Despite increased public awareness of the importance of pollinators and the value of pollinator-friendly gardens, our useful and fascinating pollinator friends continue to face huge challenges, especially lack of habitat. Pollinators need what all animals need: a place that offers healthy food, nesting/breeding sites, and over-wintering shelter. How can you help? Look no further than your own backyard—or for that matter, your front yard—to be part of the habitat solution. Did you know? Traditional lawns, a non-native monoculture, are the antithesis of a pollinator-friendly habitat. Excessive and inappropriate use of fertilizers, oil, gasoline, and potable water to maintain lawns are damaging to our environment—our wildlife, plants, groundwater, streams/rivers, and ultimately our pollinating insects. From a pollinator’s perspective, when it comes to lawns, less is definitely more! Consider some options for transitioning a traditional lawn to a pollinator-friendly habitat. Reduce portions of lawn that struggle to survive, such as those in deep shade or on steep slopes. Eliminate lawns that are tough to maintain, hard to access, such as those around trees and shrubs or narrow strips. Remove a small, generic, unused front lawn and replace it with an interesting, diverse landscape that reflects your sense of style and place. Replace portions of lawns with mixed borders and larger beds. The easiest way is to enlarge existing beds and borders or combine several smaller beds into one larger (easy to mow around) bed. Incorporate edibles throughout your landscape so family and neighbors can see how pollinators dine on your flowers while helping to produce your fruits and veggies. What a deal! Remember that more than 2/3 of North Carolina’s 400 bee species, including bumble bees, nest in the ground, so go easy on the mulch, particularly around the base of shrubs and grasses. Try some flowering groundcovers in place of mulch. Once established, they can save time and money while supplying more pollinator food and adding color and beauty. Shift from a high-maintenance, perfect turf—more appropriate for athletic fields and golf courses—to a lawn that incorporates a mix of low-growing flowering plants. The University of Minnesota’s BeeLab trialed various grass seed mixes that incorporated both native and non-native flowering plants and showed particular success with white clover (Trifolium repens), self-heal (Prunella vulgaris lanceolata), and creeping thyme (Thymus serpyllum). 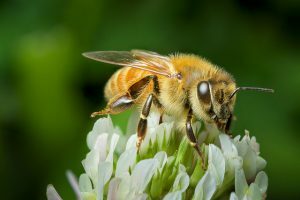 Their publication, Flowering Bee Lawns for Pollinators, emphasizes the importance of picking the right flowers for the site and details how to add flowering plants to an established lawn. Practice bee-friendly lawn care. A healthy lawn typically needs little watering, fertilizer, or pesticides. – Water established lawns only during drought. – Fertilizing can include leaving grass clippings, incorporating some nitrogen-fixing clover in your lawn, slow release organic fertilizers, and top-dressing with weed-free compost each year to provide needed nitrogen—and other nutrients as determined by a soil test. – Weed control is a challenge for naturally-maintained, pollinator-friendly lawns, but proper care of a healthy lawn can reduce weeds by 80% or more. As we celebrate National Pollinator Week with the gift of providing a healthy habitat, can we shift to perceiving great expanses of perfect bright green lawns as wasteful, missed opportunities for life-supporting landscapes? Can we welcome the clover blooming in our lawns as free fertilizer for the grass and food for the bees? Can we value a landscape that supports life rather than needing to be on life-support? Lawn Maintenance: How Much is the Right Amount? How do you keep your lawn looking respectable year-round? You know you have to mow, but how much else do you need to do? 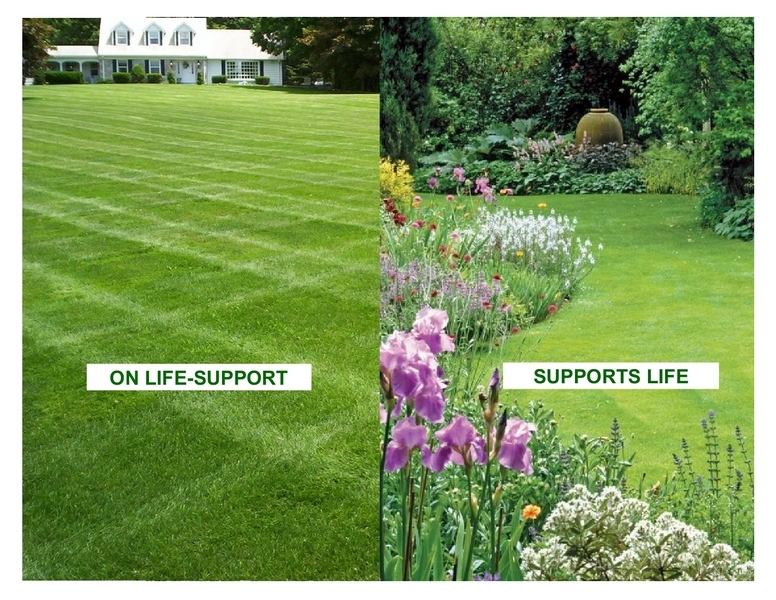 Do you want a great lawn or a “good-enough” lawn? Here are tips on how to have the lawn you want. 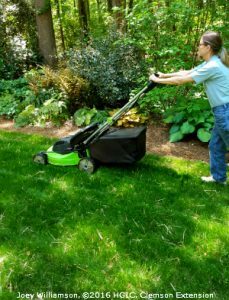 Mowing is key to keeping your lawn presentable, no matter what! Your goal: keep your cool-season grasses three inches tall, mowing off no more than a third of the height at a time. Never let your lawn get above five inches. Grass may need mowing anytime of the year that temperatures get into the 70s. Lawn growth varies wildly and individual lawns need individual evaluation. Overheard last week: “We’ve had so much rain that my husband is mowing the lawn every four days!” “Well, we’ve had so little rain that I haven’t mowed in three weeks!” Plan accordingly—fixed schedules won’t work! Many mowers will bag your cut grass, but you can save time and money—including on fertilizer—by leaving the clippings on the lawn. Mulching mowers keep the clippings small so they quickly dry out. Turf specialists estimate those clippings provide about 25 percent of the nutrients your lawn needs each year. If your mower leaves clumps of cut grass, you may need to mow more often, or be sure the lawn is drier. Break up clumped clippings to avoid smothering the remaining lawn. If you bag or rake clippings, use them elsewhere in your garden or compost—hot composting will kill weed seeds! Aerating helps root growth in compacted soil and is worth doing, especially in years you overseed your lawn. 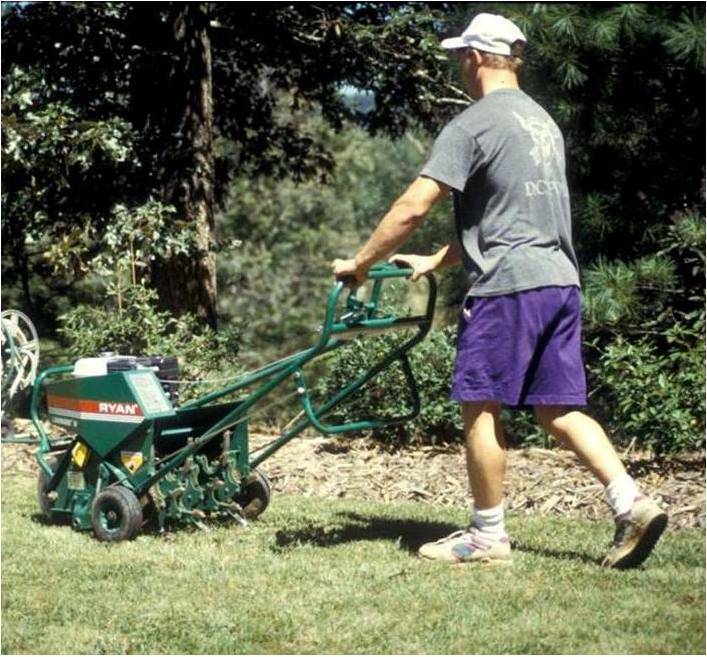 Aerate this fall or when growth starts up again in the spring. 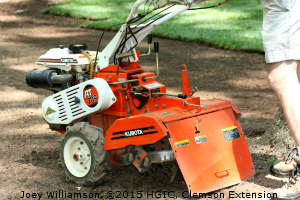 Rent equipment that brings up small cores of lawn or hire someone to do the aeration. Just poking holes in the soil creates more compaction! Cores gradually break down—rake to break them up if they bother you. Mark irrigation system emitters and hoses so you do not damage them! Lawns in active growth need consistent watering—an inch a week from rain or irrigation. Cool season grasses go dormant and brown up in the heat of summer. You may want to encourage dormancy to minimize maintenance. Dormant lawns may be able to go without rain for six weeks, but it is best to provide some watering every three weeks. Turf specialists advise that as little as ¼ inch may be enough. Grass can’t effectively use nutrients if your soil is too acid. 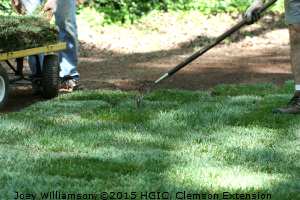 Many WNC lawns desperately need lime, but only a soil test will tell you how much. Lime takes awhile to work on soil pH—don’t expect immediate results. Test again in two or three years before liming again. Yearly nitrogen is a given, but some lawns need phosphorus, too—check your soil test! A lush lawn may require 2.5 to 3 pounds of nitrogen a year, but you can certainly use less, especially if you leave your grass clippings on the lawn. Plan to apply at least one pound of nitrogen every September and possibly another pound in October or November. If your lawn is still struggling, provide the remaining half-pound or pound in February. Fertilizing any later may lead to even lusher growth, but may make your lawn susceptible to fungal diseases come summer. 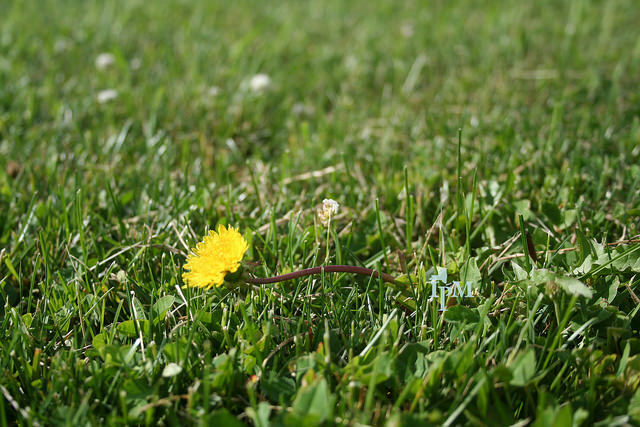 With proper maintenance, you’ll find weeds aren’t as much of a problem. Identify your weeds. Pre-emergent herbicides can prevent crabgrass—an annual weed—from sprouting in bare spots. Decide if perennial weeds justify treatment. White clover may be a desirable addition to your lawn if you don’t need a uniform stand of grass. 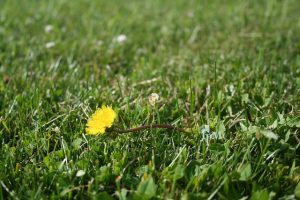 If you have a few dandelions, or other broadleaf weeds, try digging them out. Pervasive aggressive weeds may justify broadleaf herbicides. 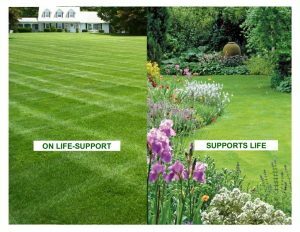 There are many lawn ailments and pests, but with proper maintenance, damage is minimal, especially if you employ proper lawn maintenance practices. North Carolina State University provides many resources for identifying and treating lawn problems.